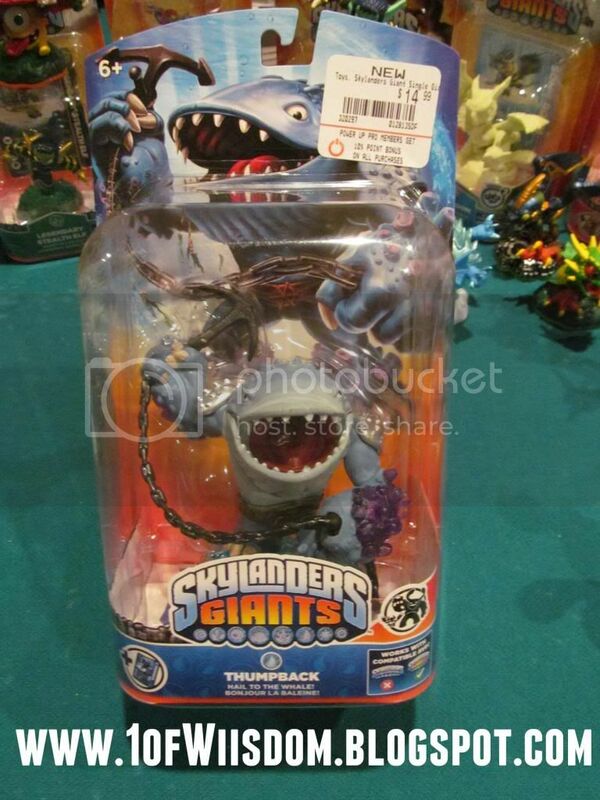 That "Chest of Exhile" You speak of DOES play a HUGE part in the Skylanders: Giants for the 3DS! :D Awesome timing for him, since we didn't have him for the Wii version, we can let him help out in the 3DS version. :D Pretty awesome, don'tcha think? Ah, I'm glad it wasn't just some randomly created and cited deal, lol. I honestly have not even put Giants 3DS in the card slot. I wanted to fully finish SSA 3DS first, but I then got back into Professor Layton and the Curious Village...just started the Diabolical Box a few weekends ago...and I've yet to play Paper Mario Sticker Star and might be getting the new Layton game, lol. Need to get an order for them and go at it that way. Does the 3DS game have the same upgrade system this time? That will be the perk of the late releases for us...Spyro, Drobot, and Wrecking Ball can have at it to! This is actually the first time I've gotten a Skylanders game for the 3DS, so I don't know how the upgrade system works. Ah...in SSA it just levels them up and grants more ability...it isn't anything like the "paths" we purchase and use in the console version. Yea, and those that are fully leveled up have specific ones showing... Though, I miss their flying abilities. On the flip side, I'll be taking the 3DS with me and the game with me but make sure that I disconnect my Wii while I'm gone because of the storm. Also followed you on Google+ as well. I'd be chatting right now, but I've gotta get set for the severe weather, as I mentioned earlier. I do the same thing...we get so many storms in the spring/summer I just have a habit of always pulling the plug. Do you ever get StreetPass Tags? I only get them from my nephew and when we are on trips. I finally got a local one this weekend and the person had like nothing to even offer puzzle wise, lol...and battling where I was in Find Mii she was useless as a Level 1 hero :( I was still excited to get someone new! Yep, glad to see you on there! I prefer the blog, but after that and Twitter, Google + is just a much slicker interface than facebook imo...I was never big on fb though...I grew up with the golden age of myspace, lol. I'd have prob been on earlier, but we played a round of Clue for my birthday :D It was my Nephew's first time to play and we won! Hah! Yup! I haven't put LC Prism on the Portal just yet, but with tomorrow being my last day of work until next week, I'll get the chance then... It'll be odd going up town this weekend and not picking up any Skylanders, but here's to hoping my hunch proves right for either Target or Gamestop and one of the two gets Flameslinger in... Would be even wilder if I found the next wave out then as well, hm? :P But, I doubt that'll happen. Very nice...enjoy your long weekend! You will be impressed by how well he lights up...looks good in the game too! Haha, I'll keep my fingers crossed you find him. I'll make the rounds tomorrow night and see if I can't find him. Don't forget Hastings...they don't sell many and might have old stock in the back...if they move the current pegs they could just reload. I was almost asleep in Cynder's...the dance party sort of woke me up, lol. I had to transfer several GBs of files to another HD to clear up room to record more. I am going to play a CH tonight and take the new Giants thru the speed challenges. I'm also going to try Crusher again in Drobot's...that one is proving to be very tough. Have you done it yet? Well, I'm off to Skylands! Good luck! Not yet. Was having a pain getting Tree Rex through DT's, but we managed. Also, I'm thinking that Hot Head, Swarm, and Bouncer may have some competition in the fav Giants Category now that I've played with EB and TB. I'm loving TB's range, but he's a bit too slow atm to take through DroBot's. So far, Tree Rex, Bouncer, Hot Head, and Eye Brawl have all safely made it through the two toughest HC's. Now, we've gotta get Swarm, Crusher, and Thumpback through them as well. Don't forget in Double Trouble's HC you can use the Anvil Rain if need be ;) Gotta it, might as well use it, lol. I haven't upgraded any, but Bouncer seems to be the most box-stock friendly in terms of dominating the HCs. I think TB and EB will be right up there with him as well for my favorites. Upgrades will prob dictate things. I agree...I am thinking I'll take TB down the secondary path to get the armor...his anchor is awesome as is imo...It isn't a projectile, but the radius is so good it is almost the same thing! Swarm can make it pretty easy. Crusher and TB may be another story. I did take both EB and TB thru around 15 challenges each. Both do great outside of Drobot's...I think it is a lot tougher on Giants than in SSA. The chompies are quicker and more dedicated. Oh, I forgot to mention it...I did look for Flameslinger locally, but came up empty. No sign of him, Fright Rider, Slam Bam, or Terrafin...basically the early release single packs. Haha, nice! Yeah, very tough to navigate DT's with a Giant...Empire of Ice's Anvil Rain will take care of that though...use it at the start and then just have the last few trolls to go!